A truely amazing man with so much talent. He will be missed forever. Seeing and hearing Iz always brings a smile to my face but a tear in my eye! I have been to Hawaii 5- 6 times and know fullwell that Israel’s beautifully unique voice and life is so very much an expression of the culture and values of the Islands. He and his music is all that is wonderful about his people and the Islands. I live in Chicago but from Hawaii, at work I always play IZ for the patients that I scan. It”s amazing how many people love his music. Alot of them know about him and alot of them want to know who he is. I work in a school as a custodian. I listen to my I-pod every night. Out of all the songs I listen to, IZ’s songs are the ones I look foward to hearing the most. They make me smile and think of all the times I have been to Hawaii. 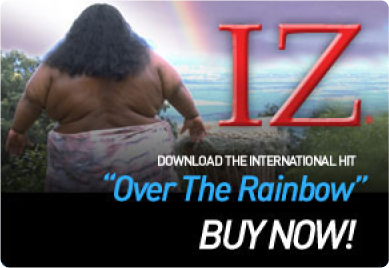 As the man says , it truly is a place over the rainbow. I wish I could have known him.